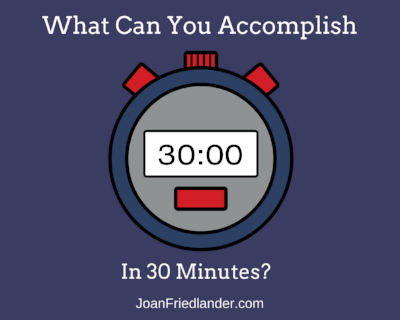 What Can You Accomplish in 30 Minutes? Many of the people I talk to have a limited amount of time and/or energy to allocate to their business activities, as few as 3-5 hours a day. Some are limited because they are still on the mend after a significant health setback, or have a persisting condition that makes it difficult to predict what they will be able to do from one day to the next. Others have children at home. They need to wait until they get their children off to school to start their business day, and may need to stop working just 5 hours later so they can pick them up and bring them home. Regardless of their specific circumstance, they feel the pressure of having far fewer hours for business activities than they have ideas and work projects. Even those working more customary hours, especially those who work in a busy office environment, are often limited to small windows of focused time before they are interrupted by a call, a request or a meeting. Here’s my question to you. If you had only 30 minutes to get something important done, and as few as 6 such reliable 30-minute segments in a single working day, what could you actually accomplish? This is my short list of what one person can do, from beginning to end, in a 30-minute time period. ♦ Interact with friends or fans on Facebook OR read and respond to posts on your favorite LinkedIn group, OR tweet, retweet and reply to your followers on Twitter. When I look at this list, it occurs to me that this is a good list of short, focused business activities. If you know what your priorities are for the day, or for the week, you can select your 30-minute activities from this kind of menu. What would you add to my list? What am I missing?